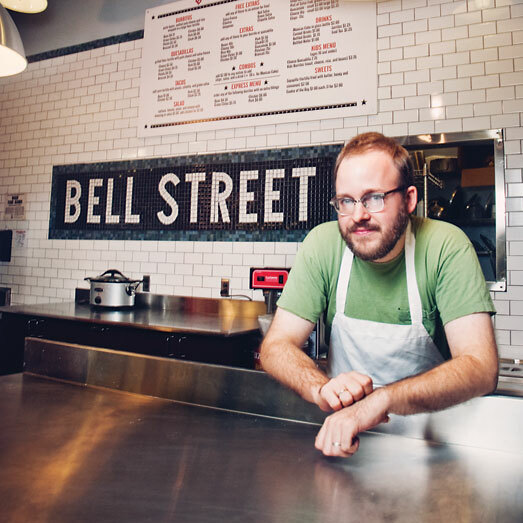 Bell Street Burritos is the latest in a string of Sweet Auburn Curb Market outposts established by entrepreneurs who like the low overhead and steady foot traffic. The place bears the mark of Hinton’s artistic personality. Its sign, for example, is a replica of those found in New York subway stations. The sleek, minimal design includes stainless-steel counters. With no disrespect to Hinton’s former career, I can say that my first bite of the burrito he makes—back when the business was called West End Burritos and had nothing but a Facebook page and a delivery route—was a religious experience. Hinton had managed to re-create the exact taste and texture of a product he and I were similarly obsessed with: the fat, juicy, San Francisco–style burrito at Tortillas, a cult restaurant on Ponce de Leon Avenue that closed in 2003. “Tortillas’ blend of tastiness and seediness was deeply fulfilling to me from the outset,” Hinton told me. With obsessive attention to detail, he picked up where the defunct restaurant left off. He folds just the right amount of melted cheese, pinto beans, white rice, and seasonings into big, steamed flour tortillas. The chipotle salsa is his alone, but the other two sauces, a red and a green, are completely faithful to the original. While you may want to add pork, chicken, potatoes, green chiles, or extra cheese to the basic bean burrito, you may also opt for delicious simplicity—with perhaps a tub of spicy guacamole on the side.